In the Pacific Ocean which spreads off Kochi, there is the grand Balaenoptera brydei. In Kochi prefecture famous for whale watching a whale is sightseeing material. While there are several kinds of whales, Balaenoptera brydei is a kind currently liked by many tourists.This Balaenoptera brydei is introduced this time. It is distinguished in outside because mustached hair is baleen is short and that apply near a nostril from rostrum edge and the right-and-left both sides of the upper surface of a snout have an upheaval line of one articles each although it is close species of a sei whale, that a trough is long and the tip has reached the navel, wide, and thick. 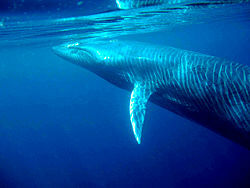 The length is also slightly smaller than a sei whale, and is only a maximum of 15.5 meters. Although Balaenoptera brydei was presupposed that only the South Africa coast is inhabited once, it was discovered around the postwar years and Ogasawara Islands, and it became clear that it was also widely distributed over the North Pacific. We decided that the International Whaling Commission will correct the appended chart of Convention for the Regulation of Whaling in 1970, and it treats this kind and a sei whale as another kind. The small fish which this kind uses as the staple food is the food of large-sized wide-ranging fish, such as a bonito, and a possibility that the group of large-sized wide-ranging fish is in the ocean space in which this kind is present also becomes high. Moreover, there is a merit which protects itself from swordfish by being attached to a whale in a bonito, and katsuokujira of this kind or a close relationship forms one small ecosystem by one individual. Balaenoptera brydei becomes known as the subject of whale watching, and is loved, and the whale is enjoyed as what is not eaten and is seen now when control of whaling is severe. In the Fisheries Agency version Red Data Book, it is regarded as the rare animal and has become a candidate for preservation. The whales are huge but look so cute and cuddly. Human just have to kill them then eat them until they become rare animals. Kind of sad. The whale is huge. Iwant to see this whale. I think this whale is beautiful. So it is great for me to see the whale. So I read this article ,I wanted to go whale watching. Balaenoptera brydei is very cool. I would like to meet Balaenoptera brydei only once. I thought that all kinds of whales are huge. I not knew there are also small size. not endangered species but rare species?